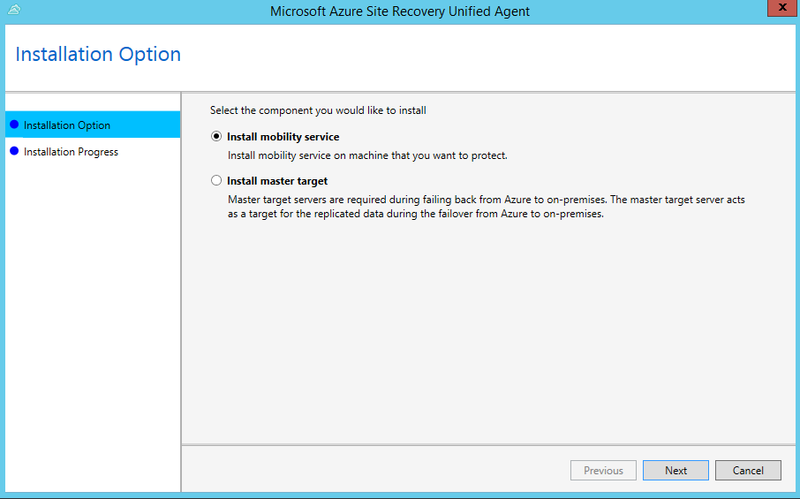 Push installation: Site Recovery installs mobility agent on the server when protection is enabled via Azure portal. Install manually: You can install the Mobility service manually on each machine through UI or command prompt. Automated deployment: You can automate installation with software deployment tools such as System Center Configuration Manager. If machines you want to replicate have active anti-virus software running, make sure you exclude the Mobility service installation folder from anti-virus operations (C:\ProgramData\ASR\agent). This ensures that replication works as expected. Ensure that all push installation prerequisites are met. Ensure that all configurations of servers fall under support matrix of VMware to Azure DR scenario. Details of push installation workflow has been described in the following sections. Pushes agent on to the source machine. Copying the agent on to source machine can fail due to multiple environmental errors. Visit our guidance to troubleshoot push installation failures. After agent is successfully copied on to the server prerequisite checks are performed on the server. Installation fails if one or more of the prerequisites are not met. If all prerequisites are met, installation is triggered. 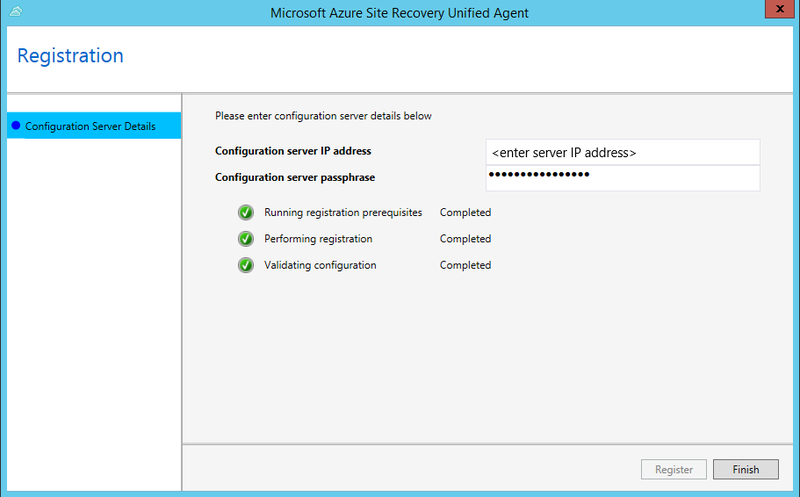 Azure Site Recovery VSS provider is installed on the server as part of Mobility agent installation. This provider is used to generate Application consistent points. If installation of VSS provider fails, this step will be skipped and agent installation will continue. If agent installation succeeds but VSS provider installation fails,then job status is marked as "Warning". This does not impact crash consistency points generation. a. To generate application consistent points, refer to our guidance to complete installation of Site Recovery VSS provider manually. b. If you do not wish application consistent points to be generated, modify the replication policy to turn off application consistent points. 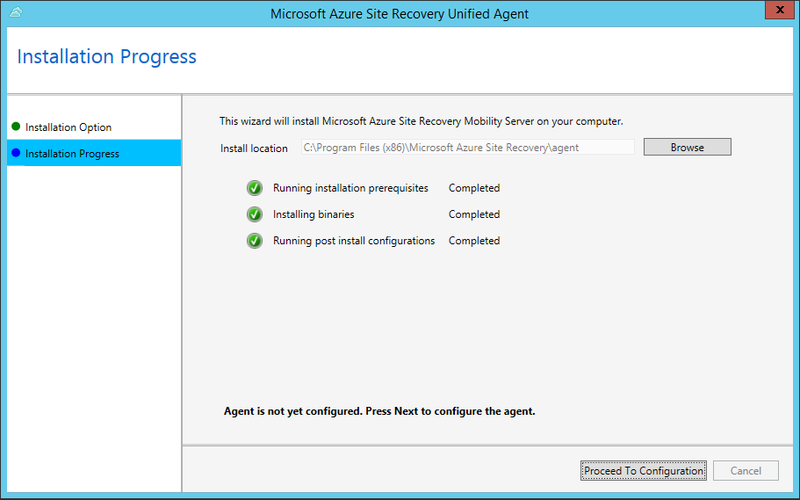 Azure Site Recovery VSS provider is installed on the server as part of Mobility agent installation. This provider is used to generate Application consistent points. If installation of VSS provider fails, then agent installation will fail. To avoid failure of mobility agent installation, use 9.23 version or higher to generate crash consistent points and install VSS provider manually. Locate the installer based on the operating system of the server. If you are replicating Azure IaaS VM from one Azure region to another, don't use this method. Use the command-line-based installation method instead. Copy the installation file to the machine, and run it. In Installation Option, select Install mobility service. Select the installation location > Install. Monitor the installation in Installation Progress. After the installation is finished, select Proceed to Configuration to register the service with the configuration server. In Configuration Server Details, specify the IP address and passphrase you configured. Select Register to finish the registration. Copy the installer to a local folder (for example, C:\Temp) on the server that you want to protect. 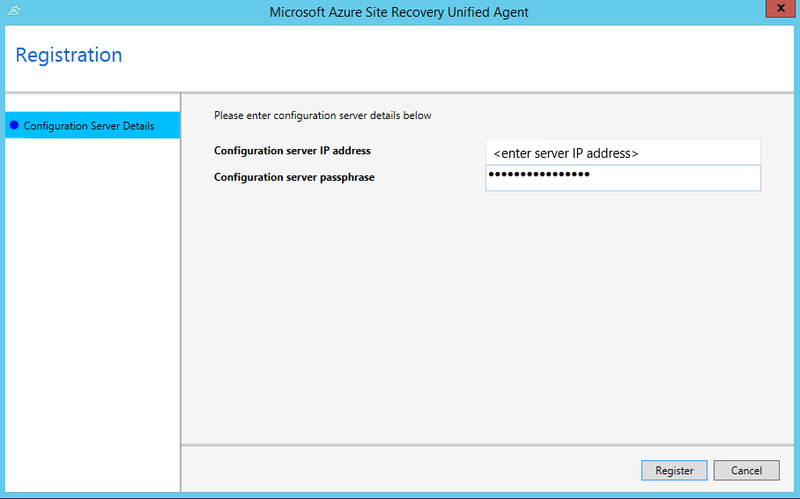 Register the agent with the configuration server. /Role Mandatory installation parameter. Specifies whether the Mobility service (MS) or master target (MT) should be installed. /InstallLocation Optional parameter. Specifies the Mobility service installation location (any folder). /Platform Mandatory. Specifies the platform on which Mobility Service is installed. VMware for VMware VMs/physical servers; Azure for Azure VMs. /Silent Optional. Specifies whether to run the installer in silent mode. Agent configuration logs Under %ProgramData%\ASRSetupLogs\ASRUnifiedAgentConfigurator.log. /CSEndPoint Mandatory parameter. Specifies the IP address of the configuration server. Use any valid IP address. /PassphraseFilePath Mandatory. Location of the passphrase. Use any valid UNC or local file path. -r Mandatory installation parameter. Specifies whether the Mobility service (MS) or master target (MT) should be installed. -d Optional parameter. Specifies the Mobility service installation location: /usr/local/ASR. -v Mandatory. Specifies the platform on which Mobility Service is installed. VMware for VMware VMs/physical servers; Azure for Azure VMs. -q Optional. Specifies whether to run the installer in silent mode. -i Mandatory parameter. Specifies the IP address of the configuration server. Use any valid IP address. -P Mandatory. Full file path of the file in which the passphrase is saved. Use any valid folder. Windows VMs: From version 9.7.0.0 of the Mobility service, the Azure VM agent is installed by the Mobility service installer. This ensures that when the machine fails over to Azure, the Azure VM meets the agent installation prerequisite for using any Vm extension. Linux VMs: The WALinuxAgent must be installed manually on the Azure VM after failover. Go to %ProgramData%\ASR\home\svsystems\pushinstallsvc\repository folder on configuration server. Check which installer you need based on operating system. The following table summarizes the installer files for each VMware VM and physical server operating system. You can review supported operating systems before you start. Set up push installation for the Mobility service.